Revolutionising the way we use our smartphones, the HTC One packs premium tech within its slender aluminium casing. Whether you love taking photos, listening to music or watching films on your mobile, the HTC One takes entertainment to new heights of enjoyment. With a Full HD display, the HTC One shows your content in mesmerising 1080p; perfect for high definition movies or browsing your social updates with BlinkFeed. Capture detailed photographs on the UltraPixel camera and create your own montages with HTC Zoe. With twin frontal speakers and Beats Audio integration, HTC BoomSound energises your audio experience to the max. 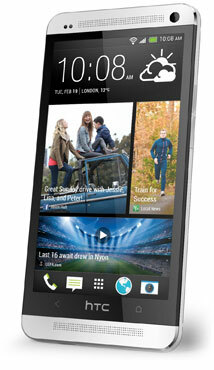 Why not order your HTC One smartphone from mobiles.co.uk? Order with us today and have the HTC One before your friends. The new home screen for the HTC Sense UI. Be amazed as your essential social feeds and news sources deliver the latest information to your fingertips. Powered by built in amplifiers, the two speakers on the HTC One were made to energise your audio. Beats Audio integration enhances the volume of your multimedia without distorting quality. Using additional microphones, the HTC One can detect loud noises that are disrupting your phone call and automatically turn up the volume to help you hear. Rather than boost the megapixel count, the HTC One camera offers improved light capture and larger pixels to give you more detail on your images. Make your pictures come alive with HTC Zoe. This feature captures a blast of 20 photos and 3 second video bursts to transform your memories for everyone to see. Use your HTC One as a remote control for your TV. Choose channels, browse the program guide and be reminded of when your favourite shows are on air.